Even though two-thirds of American adults visit the digital media published by newspaper companies, the average time spent in each session is an anemic 1.1 minutes per day – notably below the engagement enjoyed by competing media. The good news for publishers, as reported this week by the Newspaper Association of America, is that the number of unique visitors accessing newspaper websites grew to a record 161 million in March. This represents a 19% increase in unique visitors over the prior year and 66.6% of all adults in the United States, according to data provided to the industry organization by the comScore analytics service. The bad news for publishers is that the average visitor in March spent only 1.1 minutes per day at a digital newspaper venue, according to supplementary data supplied to Newsosaur by comScore. The data show that the engagement rate at newspapers falls well under the time spent at competing digital destinations. In comparison to the 1.1 minutes spent daily at newspaper sites, the average time spent on social media is 33 minutes per day and the average time spent at search sites is 3.6 minutes per day, said Andrew Lipsman, a vice president of comScore. 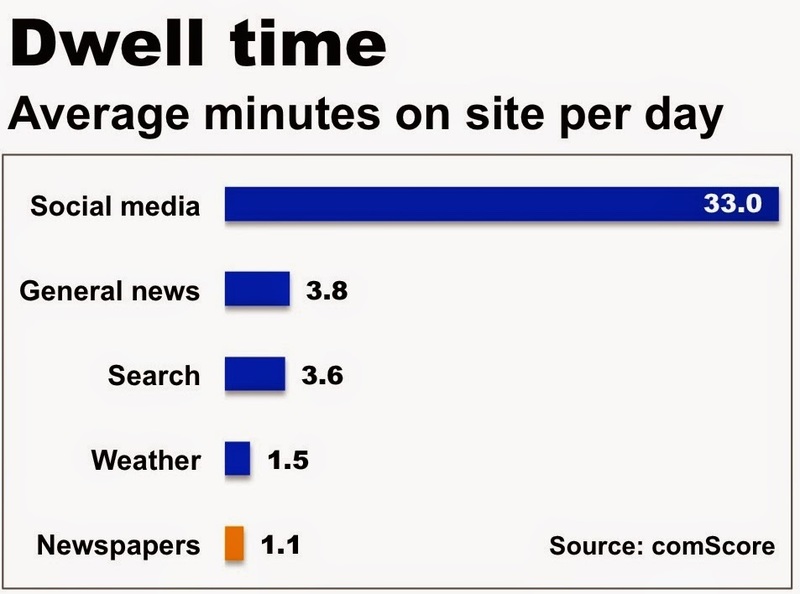 Engagement at newspapers is weaker than the dwell time at other news sites, too. In a group of dozens of sites tracked by comScore that includes the likes of Yahoo News, NBC News, BuzzFeed and CNN, the average visit is 3.8 minutes per day. As illustrated below, even weather sites do better than newspapers, hanging on to visitors an average of 1.5 minutes per day. The popularity of newspaper articles at aggregation sites doesn’t generate revenues for publishers. This may be one reason that digital advertising sales at newspapers advanced 1.5% in 2013 while over-all digital sales grew by 17%. Although there is little newspapers can do about aggregators usurping some unknown chunk of their traffic, publishers should not be content with merely celebrating the year-to-year lift in unique individuals visiting their sites. Now that newspapers are attracting the attention – at least once a month – of two-thirds of the country, publishers need to encourage the visitors to stick around with compelling content, robust utility and the passionate community engagement that rivets users to the social media. Thanks for the piece, Alan. One correction on the 161 million uniques - that likely doesn't represent anywhere near 2/3 of adults. If I also set my browser so that it clears off 3rd party cookies when I close it down at the end of the day, I am (in most instances) going to track as new unique the next day. "Unique visitors" is really more "unique device sessions." And some of the growth in uniques is being driven by the proliferation of devices. Still a valid metric to use to measure relative growth, period over period (which was really your intent, and which I agree with), but it's not a number you can compare to total U.S. population. I hope this data encourages more movement toward some system of micro-payment. I am not interested in subscribing to the dozens of additional separate newspapers and magazines whose stories I occasionally read. But I would happily pay a few cents to read each such item. In re comments from Tim McDougall: Agree that there may be duplications among the unique visitors cited by the NAA and produced by comScore. Because the statistic is a common metric that can be used to compared digital audiences, we are stuck with it until something better comes along. Comments here are missing the point. The issue is not just the number of unique visitors, but the duration at sites is incredibly poor and if redesigns like Boston.com are a future example, much of that time is spent loading pages...not consuming content. Alan, "compelling content" does not include words formed into sentences, right? Uniques once represented a solid measure of true audience size but since the advent of paywalls, my site's uniques have grown by a third while page views are flat to declining especially on desktop. Widespread use of incognito and private browsing tools are throwing off the raw numbers as well as the more important engagement analytics such as frequency of visit. The paywall vendors all fall short on their delivery on subscriber analytics, and the industry is trying to make the measures congruent to print for AAM by measuring even more pointless data points such as "activations" of digital subscriptions, a one-time action similar to downloading an app. Maybe it's used, maybe it isn't. Somewhat driving the low engagement is that a good piece of the total uniques is not relevant to the specific newspaper market. That's not a bad thing unless you are counting those out of market users as an audience that can add value to your in market advertisers. Time on site is important to measure. It could be higher if measured across only those members of the audience that are truly relevant to the market. But we would not know as long as we continue to take credit for inflated numbers that don't provide real value for the audience we are trying to reach. Agree, Alan. It's not a perfect metric, but it's less imperfect than others. And it's a good metric to discuss trends relative to other periods. My nit was mainly with the "66% of Americans" comment. But the 66% wasn't your main point, the trend was. - have a massive problem with the time spent figures cited, since i can't come close to replicating. i'd get roughly 6 visits per user per month and about 4 minutes per visit. - lastly, and off topic (sort of), is we have got to get over tablets as mobile; they aren't! Serious online newspaper readers are most likely paying to read an e-Edition of their newspaper. I just checked and my e-Edition website pages don't include my tracking codes for audience measurement. If they did, my minutes spent per visitor would undoubtedly increase. I wonder how true that is of other newspaper e-Editions? I plan on adding the codes to my e-Edition pages as soon as possible now.